We are always focused on new and upcoming piercing trends. Therefore we also check out which trends are coming up in the USA, Australia, South America, Asia and anywhere else. The glow in the dark tunnel trend basically started in Asia and is more and more coming over to the USA and Europe now. Currently we offer glowing tunnels in the colours transparent, blue, green, white - transparent, purple, pink and red. But keep yourself updated in our news section as we are adding new products and colours on a regular basis to our product portfolio. The glow in the dark flesh tunnels of course don´t need a battery or any electricity at all. It will be enough if you only walk in the daylight while you are wearing them. This way they will be "charged" and ready to glow in the darkness. If you prefer small piercings instead of the big, stretched ones you are also right at our shop. You can find a great selection of different Barbels, Banana Piercings, Labrets, Ball Closure Rings and Fake Plugs that glow in the dark here. It works just as with the classic tunnel and plug jewelry. Just go into the daylight for a while and this luminescent piercing jewelry will shine in the dark. No matter what kind of glo in the dark tunnel and piercing jewelry you may like. 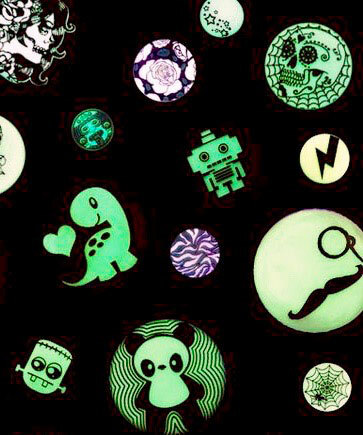 We are sure you will find the one that suits you here in our glow in the dark piercings shop.